Bees and wasps are the stinging insects of most concern in New Jersey. Found on every continent except Antarctica and in all environments with flowering plants, bees are nature's greatest pollinators and wasps, which feed on other insects, are nature's pest controllers. Both are beneficial insects that because of their stinging behavior can pose a serious threat to humans. Sharing biological ancestry with ants, bees and wasps have six legs, chewing mouthparts, and two pairs of transparent or translucent wings with the hind wing slightly smaller than the forewing. Both bees and wasps undergo complete metamorphosis from egg to larva to pupa to adult. Some species live in huge communal colonies ordered by a strict caste system like ants; other species live solitary lives or in unstructured small groups. With the sole exception of the Honey Bee, bee and social wasp colonies die out at the beginning of winter. A lone fertilized queen will over-winter deep in the hive or burrow into the ground, emerging in spring to begin a new colony and build a new nest. Old nests are not reused. Solitary wasps winter in ground burrows, also emerging in spring to mate and reproduce again. Although they are often confused because of similar coloration, bees and wasps differ in several distinct ways. Bees are covered with short, dense hairs and are thick waisted; whereas wasps are smooth with thin, constricted waists. Bees feed on plant nectar while wasps are primarily predators, feeding on other insects. Of particular importance is the difference in stinging behavior between bees and wasps. Bees have a hooked stinger and die after they sting, leaving their stinger with the attached venom sac in their victim. 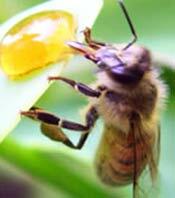 This makes a bee sting especially potent as venom continues to be released into the victim until the sac is empty. 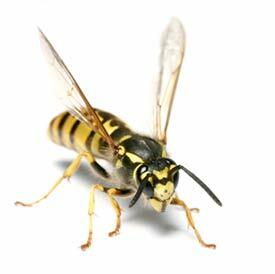 Wasps, which include Yellow Jackets and Hornets, have straight stingers and can sting their victim repeatedly. Unlike bees which usually attack only when bothered or when their nest is threatened, wasps are extremely aggressive and may attack without provocation. As they sting, wasps release alarm pheromones to signal hive mates to join the attack. Repeated stings by swarming wasps can be fatal, even to the non-allergic. Bee and wasp stings send more than half a million Americans to the emergency room every year and result in 50 to 100 deaths annually. For most people, bee and wasp stings are painful and cause swelling and itching that can last for several days. But for the more than 2.5 million Americans who are allergic to bee stings, a single sting can cause life-threatening anaphylactic shock that can be fatal if antitoxin is not promptly administered. Carpenter Bee. Often mistaken for bumble bees because of their large size and similar black and yellow striped markings, carpenter bees are 1 to 1 1/2 inches long with a shiny abdomen instead of a bee's typical hairy abdomen. Solitary insects, carpenter bees are wood destroyers, tunneling into soft outdoor wood to lay their eggs. Their presence is revealed by the perfectly circular 1/2-inch diameter holes they leave in fascia boards, porches, decks, siding, sheds, even picnic tables. Living in mating pairs, only the usually docile female carpenter bees have stingers. Stingerless males, however, are highly aggressive and can be a considerable nuisance dive bombing anyone who comes too close to the nest. Because of their habit of returning to the same site year after year, carpenter bees can cause serious damage to wood structures. Find out more about carpenter bees in our wood destroying insect section. Ground Bee. Several species of bees build their nests in the ground, but the two of most concern to New Jersey residents and business owners are the usually docile bumble bee and the highly annoying sweat bee. The Bumble Bee measures about 3/4 to 1 1/2 inches long. Bumble bees are one of New Jersey's largest bee species and considered a ground bee. Hairy with distinctive black and yellow coloration, bumble bees have a round, robust appearance and buzz loudly when disturbed. Frequent garden visitors, bumble bees collect pollen and nectar to produce a stored food called "bee bread" that they feed to developing offspring. Living in large social colonies underground, bumble bees can be a problem if they build their nests in garden or lawn areas frequented by people. Occasionally, these bees invade buildings to nest in soffits or attics. Bumble bees are docile unless provoked or their nest is threatened. They are a problem only when nests are built in trafficked areas. Halictid (Sweat) Bees are brightly colored. The halictid or "sweat" bee is the most problematic ground-dwelling bee for humans. Just 1/4 to 1/2 inch long, these tiny bees are a distinctive shiny metallic black and green color. A persistent summer pest, halictid bees hover around humans, landing on skin to gather sweat droplets. They will sting if startled or swatted, although stings are considered minor. More of a nuisance than a threat, their persistent hovering can be upsetting at outdoor events. Honey Bee. A beneficial insect protected by law, honey bees are 1/2 inch long and covered in dense short golden hairs with distinctive brown bands striping the abdomen. Vital agricultural helpmates, these prolific pollinators collect nectar and pollen from flowering plants, using it to create honey to nourish their young and sustain themselves through the winter. Honey bees live in massive colonies that may house hundreds of thousands of individuals. They build wax-comb hives in tree hollows but may also colonize attics, chimneys, under siding or inside wall voids. Unlike other bees and wasps, honey bee colonies do not die out over the winter. Honey bees over-winter in their hives subsisting on stored honey. When honey bees nest in inhabited spaces, they not only present a serious stinging risk to humans but dripping honey can permanently stain ceilings and walls and attract problem pests like ants, cockroaches and flies. Honey bees are protected by law and so cannot be eradicated by a pest control company, but a qualified beekeeper can relocate the bees and remove the hive. To avoid serious secondary pest infestations, the affected area should be professionally cleaned. Hornet. 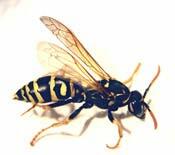 The largest wasp species, hornets are brown with orange stripes and 1 to 1 1/2 inches long. More common in rural areas, hornets live in large social colonies. Adept hunters, hornets feed on insects, grasshoppers, yellow jackets, honey bees and flies. They build large, layered paper nests in well-protected spaces such as animal burrows, hollow trees and between the branches of shrubs but may also invade barns, attics, chimneys and wall voids. Hornets are extremely aggressive with a very painful sting. Loud vibrating sounds from lawn mowers or leaf blowers can trigger swarming behavior and dangerous stinging attacks. Multiple hornet stings can be deadly even to those who are not allergic. The Bald-Faced Hornet also called the white-faced hornet for the unique white markings on its head, is black and about 7/8 inch long. Bald-faced hornets are best known for their unique aerial nests, the large, gray, football-shaped paper nests found hanging from high tree branches. While bald-faced hornets have little interest in humans, they are aggressive protectors and will swarm and sting repeatedly if provoked. Wasp. There are more than 100,000 species of wasp. 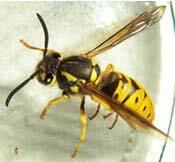 Varying in size and coloration, wasps are generally smooth-bodied with little to no hair. Hornets and yellow jackets, two of the most aggressive wasp species, live in huge social colonies, but many wasps like paper wasps and cicada killers are solitary, living individually or in groups with no social structure. Predatory insects, wasps feed primarily on other insects. Depending on species, wasps may nest in abandoned underground burrows, sheltered tree cavities, under eaves, in attics or garages, in wall voids or they may build aerial nests. Unlike bees, wasps have straight stingers and can sting multiple times, making them a serious health threat, even to the non-allergic. Attracted by bright colored clothing and perfume scents and often nesting in close proximity to humans, wasps can be a serious problem at outdoor gatherings, particularly in autumn when they become highly aggressive. Wasp colonies die in winter except for a fertilized queen who winters deep inside the hive or underground. Hives are abandoned when the colony dies in the fall and new hives built as eggs hatch and mature in spring. The Paper Wasp is one of the most common problem wasps for home and business owners, the yellow and brown striped paper wasp has a slender 1-inch long body with a thin waist, tapered abdomen and long, trailing legs. Avid predators, paper wasps feed on insects, spiders and caterpillars. Paper wasps mix chewed wood fibers with saliva to create unique round, gray, papery nests that hang from a narrow stalk much like an upside-down umbrella. Nests consist of a single exposed paper comb with as many as 100 cells visible; however, most nests are smaller, containing just a dozen or so cells. The dark heads of larvae can sometimes be seen in inhabited cells. Paper wasps typically build their nests in well-sheltered spaces including under eaves and roof peaks, underneath porches and decks, and inside grills and electrical boxes but may invade crawl spaces or attics. These solitary wasps have no social structure but typically live and build nests in small groups. Adults can often be seen resting on the surface of the comb. Paper wasps are aggressive when provoked and have a vicious sting. 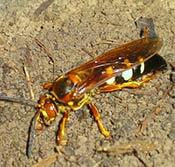 Cicada Killer wasps are known for their monstrous size; up to 2 inches in length, cicada killer wasps often cause alarm. However, these gentle giants are not easily provoked and rarely attack humans. Feeding primarily on sap and nectar, cicada killer wasps hunt cicadas which they seal into egg cells as food for growing larvae. Solitary insects, these wasps nest underground in dry, soft soil where vegetation is sparse. Their penchant for burrowing in sand traps can make them a nuisance on golf courses. If bothered, their sting is painful. The Yellow Jacket is a stocky, black and yellow wasp about 1/2 inch long. Yellow jackets live in huge social colonies. Yellow jackets build massive underground nests harboring thousands of individuals but may also build their layered, papery combs in the attics or wall voids of buildings. Feeding primarily on insects and spiders, yellow jackets also seek out sugars and can be a serious summer pest as they forage in trash receptacles or crawl into soda cans. Quick to swarm and aggressive repeat stingers, yellow jackets are most violent in late summer and are responsible for most life-threatening stinging attacks in the United States. Stinging insects can be a serious problem for home and business owners. If you notice bees or wasps repeatedly flying in or out of an area or begin to find them inside your home, a bee or wasp nest is likely located nearby. Contact the Allison Pest Control professionals immediately. The potential danger from stinging attacks makes bee and wasp nest removal a job for experienced professional pest control experts. Allison Pest Control's Home Pest Protection Plans provide three exterior barrier treatments to limit stinging pest encroachment onto your property. Our experienced pest control technicians will provide free retreatments between regularly scheduled visits and provide interior inspection and treatment anytime; all you have to do is call. Commercial businesses and properties have many options when it comes to bee and wasp treatment and hive removal. Ask your sales representative about services tailored to your specific stinging insect needs today or get a free pest inspection and prices.